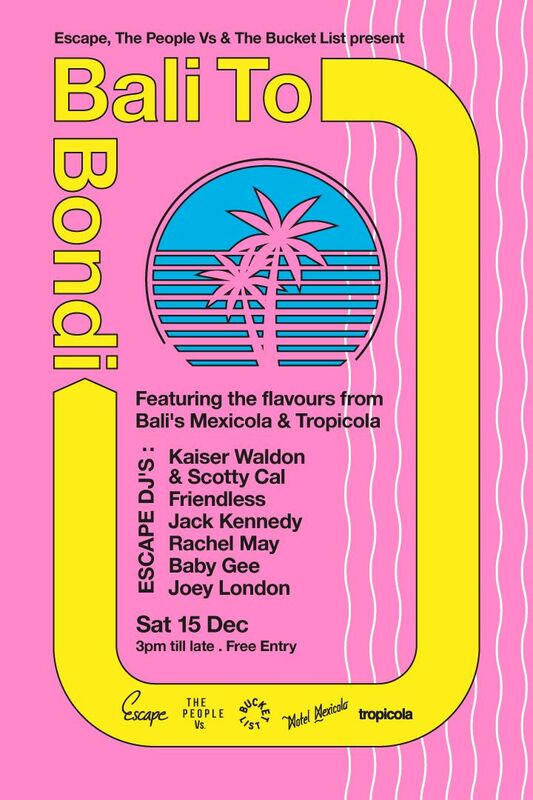 Bringing the sounds and flavours of Bali’s Motel Mexicola & TropicolaBeach Club to Bondi Beach, for one day only, featuring Bali's Escape DJ's. The famous ' Escape Presents ' parties were founded in the Summer of 2012 on Manly beach, quickly becoming an institution before making its move to Bondi. Since then Escape has successfully established itself in Bali as one of the leading house and techno brands throwing weekly events at various locations around the island from cliffs of Uluwatu to beaches of Seminyak and Canggu. Teaming up with street wear legends, The People VS, Escape are coming home for a one-off special event this summer at The Bucket List! If good food, good music and summer vibes are your thing, join us Saturday, 15th Dec, 3pm til late.